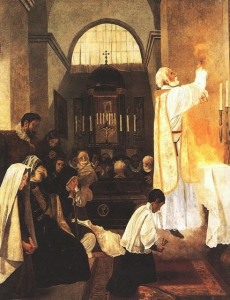 How the priest celebrates the mass is a indicator of the effectiveness of his priesthood. Please read the great article below. Save the liturgy and save the world. The Holy North American Martyrs are eight in number; five died in what is now Canada, three in what is now the United States. All are Jesuits, all are French in origin. They came in the 1640’s to New France, to add their strength to that of the Franciscan Recollets, who had preceded them by a few years. There was not yet any bishop to assist them; the first bishop of Quebec, Blessed Monsignor Francis Montmorency de Laval, arrived only in 1658. Father Antoine Daniel was the first to die in Canada, after ten years among the Hurons. The chapel of the village where his mission stood was filled with his faithful Christians, and he had just finished saying Mass, when the Iroquois attacked in July of 1648. The men ran to the palisades; the priest, when the invaders broke through, went to the chapel door and faced the Iroquois, warning them of God’s anger. They slew him at once and threw him into the chapel they had already set on fire, still occupied by the women and children. Saint John de Brebeuf, the giant of the Huron missions was a native of Normandy, noted for his physical height and strength and still stronger love of God. Arriving in 1625, at the age of 32 years, he spent three years with the Hurons of Ontario, winning their love and respect to such a degree that they wept when he was recalled to Quebec City for a time in 1628. We still do not know how to adore the Master of life as you do! Political questions obliged him to return to Europe in that year, but he was back in Canada in 1633, and among his Hurons the following year. He labored until 1649, in which year the luminous Cross he had seen in the sky the year before, presage of his martyrdom, became a reality for this glorious father of the Faith in America. The Iroquois took him prisoner in the village of Saint Louis near the Georgian bay of Lake Huron. He was tortured, scalped; pieces of his flesh were removed and eaten before his eyes; boiling water was poured over him, hatchets heated red-hot were placed on his chest, back and shoulders. He did not utter a single cry. His death occurred in March of 1649. His young companion in the mission, Father Gabriel Lallemant, 39 years old in that year and of a delicate constitution, was martyred the next day; he had been forced to witness the death of his beloved Father Brebeuf. He cried out: Father, we are given up as a spectacle to the world, the Angels and men! And he went up to him and kissed his bleeding wounds. Facing the same fate afterwards, he knelt down and embraced the stake to which he was to be tied, to make his final offering to God. He himself survived for longer still, seventeen hours. The Iroquois set fire to the bark they had attached to him; he was baptized in mockery of the faith, in boiling water, not once but many times. The savages cut the flesh of his thighs to the bone and held red-hot axes in the wounds. They finally tired of their task and finished him with a blow from an axe. Nine months after the martyrdom of these two, Saint Charles Garnier, also missioned with the Hurons, fell victim in his turn. He was a valiant priest who had said: The source of all gentleness, the sustenance of our hearts, is Jesus in the Blessed Sacrament. He was of a wealthy family, and as a student in the Jesuit college of Clermont, would deposit his weekly allowance in the church’s collection box for the poor. In the mission he slept without a mattress, and when traveling with the Indians, would carry the sick on his shoulders for an hour or two to relieve them. He died the day before the feast of the Immaculate Conception, on December 7, 1649, while aiding the wounded and the dying; an Iroquois fired two bullets directly into his chest and abdomen. Seeing a dying man near him, twice he tried to stand and go to him, and twice he fell heavily. Another Iroquois then ended his life with an axe. Saint Noel Chabanel had been a professor in France; he suffered the temptation to return to Europe when he saw clearly the state of the souls of the natives. He overcame it and made a vow in writing of perpetual stability in the Huron mission. He died alone when, pursued by the Iroquois in the company of a few of his Huron neophytes, he had to stop, exhausted, in the woods. He told the others to flee. It was later that an apostate Huron avowed he had killed him in hatred of the Christian religion and cast his body into a river. He died on the feast of Our Lady which he particularly loved, that of the Immaculate Conception, one day after the martyrdom of Father Garnier, on December 8, 1649. The great missionary Isaac Jogues was martyred, as it were, twice; after being surprised by the Iroquois while traveling, he might have escaped from the midst of his Hurons who were being seized at the same time, but did not want to abandon them. He was tortured in ways like those we have described for the others, but he survived and was held prisoner under the most painful conditions for long months, by the Iroquois of what is now New York State. He finally escaped and returned to Europe, aided by the Dutch. He was not recognized when he knocked on the door of the Jesuit house in Paris. When the Holy Father Urban VIII was asked for a dispensation for him to say Mass, since his fingers had been badly mutilated, he replied: Can one deny the right to say Mass to a martyr of Christ? The Saint returned to Quebec and offered himself for an Iroquois mission, saying he would not return. He was killed in 1646 by a sudden blow of an axe from behind, by a savage of the mission where he stayed. During the original captivity of Father Jogues, his assistant, Brother René Goupil, was with him, a prisoner like himself. He was the first of the Jesuit martyrs to die. He was a donné, a coadjutor Brother who desired to come to the American missions to assist the priests, having been found to have too unstable a health to be ordained. He was said never to have lost the smile which characterized his gentle disposition. He died in 1642, when least expecting it, from the blow of an axe, while he was helping a little child to make the sign of the cross. Father Jogues succeeded in burying his young assistant, at once calling him a martyr, because slain in hatred of God and the Church, and of their sign which is the Cross, and while exercising ardent charity towards his neighbor. And finally, Saint Jean de la Lande, who had the heart of an apostle, engaged himself to work as an auxiliary of the missionaries, for love of Jesus Christ and souls. On the day of his departure, he was expecting to meet with death in the new world. Unafraid of the sufferings he knew awaited him, he accompanied Father Jogues and was slain in the same mission as the priest, on the following day, October 19, 1646. Rev. 8:3-4  And another angel came, and stood before the altar, having a golden censer; and there was given to him much incense, that he should offer of the prayers of all saints upon the golden altar, which is before the throne of God. And the smoke of the incense of the prayers of the saints ascended up before God from the hand of the angel. Blessed Anne Catherine Emmerich revealed in her Visions that saints are particularly powerful on their feast days and should be invoked then. Those of us from the Great Lakes region have a strong devotion to the North American Martyrs. These brave and holy priests risked their lives to bring Christ to the Indians in a very harsh region weatherwise. St. Issac Jogues is perfect example of the type of Catholic we need today who is not afraid of going into the lion’s den and preaching the TRUTH. 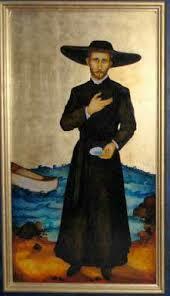 St. Issac Jogue please pray for us. French missionary, born at Orléans, France, 10 January, 1607; martyred at Ossernenon, in the present State of New York, 18 October, 1646. He was the first Catholic priest who ever came to Manhattan Island (New York). He entered the Society of Jesus in 1624 and, after having been professor of literature at Rouen, was sent as a missionary to Canada in 1636. He came out with Montmagny, the immediate successor of Champlain. From Quebec he went to the regions around the great lakes where the illustrious Father de Brébeuf and others were labouring. There he spent six years in constant danger. Though a daring missionary, his character was of the most practical nature, his purpose always being to fix his people in permanent habitations. He was with Garnier among the Petuns, and he and Raymbault penetrated as far as Sault Ste Marie, and “were the first missionaries”, says Bancroft (VII, 790, London, 1853), “to preach the gospel a thousand miles in the interior, five years before John Eliot addressed the Indians six miles from Boston Harbour”. There is little doubt that they were not only the first apostles but also the first white men to reach this outlet of Lake Superior. No documentary proof is adduced by the best-known historians that Nicholet, the discoverer of Lake Michigan, ever visited the Sault. Jogues proposed not only to convert the Indians of Lake Superior, but the Sioux who lived at the head waters of the Mississippi. In early spring of 1644 he returned to Canada, and in 1646 was sent to negotiate peace with the Iroquois. He followed the same route over which he had been carried as a captive. It was on this occasion that he gave the name of Lake of the Blessed Sacrament to the body of water called by the Indians Horicon, now known as Lake George. He reached Ossernenon on 5 June, after a three weeks’ journey from the St. Lawrence. He was well received by his former captors and the treaty of peace was made. He started for Quebec on 16 June and arrived there 3 July. He immediately asked to be sent back to the Iroquois as a missionary, but only after much hessitation his superiors acceded to his request. On 27 September he began his third and last journey to the Mohawk. In the interim sickness had broken out in the tribe and a blight had fallen on the crops. This double calamity was ascribed to Jogues whom the Indians always regarded as a sorcerer. They were determined to wreak vengence on him for the spell he had cast on the place, and warriors were sent out to capture him. The news of this change of sentiment spread rapidly, and though fully aware of the danger Jogues continued on his way to Ossernenon, though all the Hurons and others who were with him fled except Lalande. The Iroquois met him near Lake George, stripped him naked, slashed him with their knives, beat him and then led him to the village. On 18 October, 1646, when entering a cabin he was struck with a tomahawk and afterwards decapitated. The head was fixed on the Palisades and the body thrown into the Mohawk. Please read the great article by Philip Kosloski below on the power of the Brown Scapular, which should be one of your weapons you use in your daily spiritual combat. 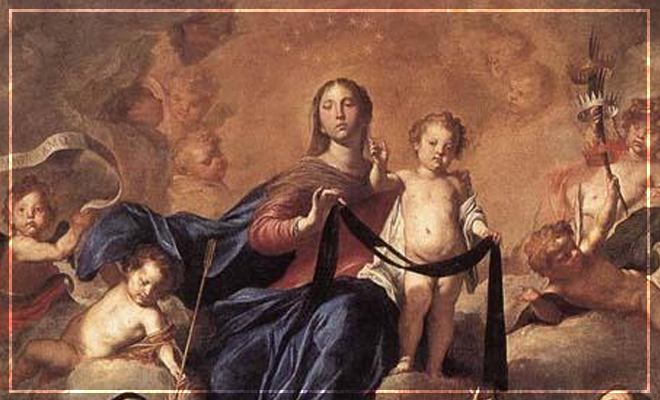 July 16th is the feast day of Our Lady of Mount Carmel, so it is fitting to examine a mighty spiritual weapon connected with this devotion to the Blessed Mother: the Brown Scapular. There are many “promises” to the wearers of this scapular, but we must always keep in mind that the Brown Scapular is NOT a lucky “charm” that grants someone access to eternal life no matter what kind of life they live. You will understand why the devil works against those who promote the Scapular when you hear the story of Venerable Francis Ypes. 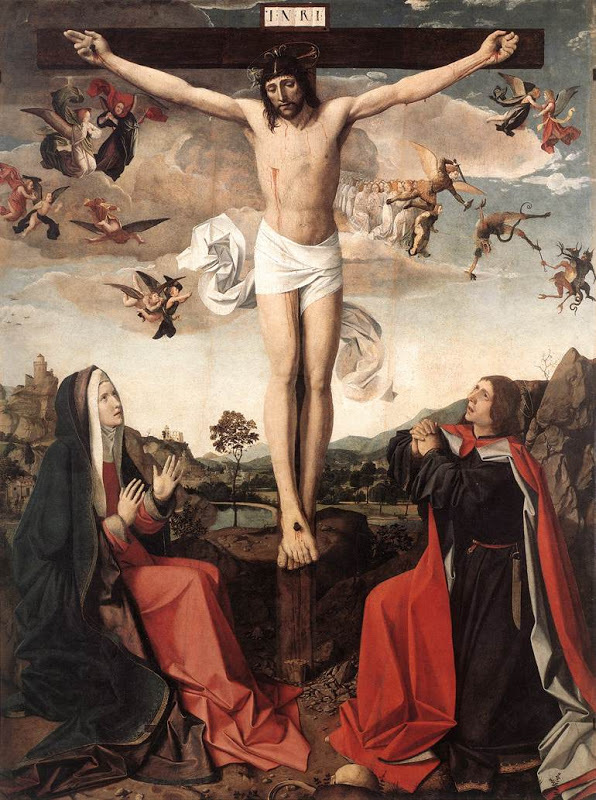 One day his Scapular fell off. 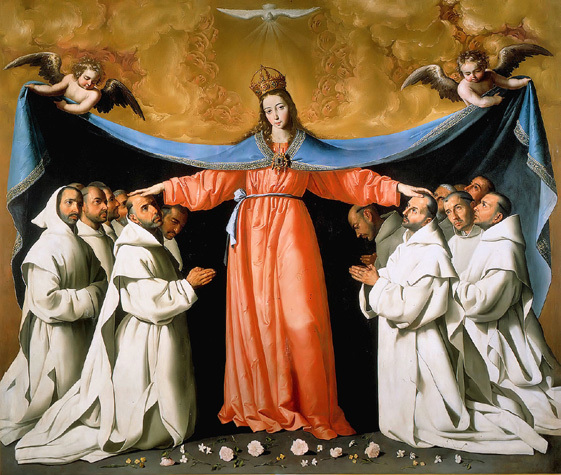 As he replaced it, the devil howled, “Take off the habit which snatches so many souls from us!” Then and there Francis made the devil admit that there are three things which the demons are most afraid of: the Holy Name of Jesus, the Holy Name of Mary, and the Holy Scapular of Carmel. To that list we could add: the Holy Rosary. So yes, the Brown Scapular is a powerful weapon against Satan and can help us along the road to holiness, but it is not “magic” and if we refuse to lead a life divorced from sin, the Scapular will not be found on us when we die. We must devoutly wear it, and choose to serve God and the Blessed Virgin Mary. The Brown Scapular can amplify our spiritual life and help us in our time of greatest need. Our Lady of Ransom and Mercy please pray for us and for the conversion of all Muslims and Mormons to the one true faith. The Blessed Virgin appeared in the thirteenth century to St. Peter Nolasco, St. Raymund of Pennafort, and to James, king of Aragon, requesting them to found a religious institute with the object of delivering Christian captives from the barbarous Saracens (Collect), who then held a great part of Spain. Its impossible to not notice, or to be affected by, the increasing pridefulness and vanity of our friends and family. It is rare to find a person that accepts correction well or is repentant about their sinful ways. This does not bode well for the world or for their eternal salvation. Humility is the glue that hold all the virtues together. Let us all pray fervently for an increase in humility. St. Augustine please pray for us. Please read the important essay from Father Peter Carota on the importance of humility in your spiritual development. IN Paradise there are many Saints who never gave alms on earth: their poverty justified them. There are many Saints who never mortified their bodies by fasting, or wearing hair shirts: their bodily infirmities excused them. There are many Saints too who were not virgins: their vocation was otherwise. But in Paradise there is no Saint who was not humble. We often study diligently to guard against and correct ourselves of the vices of concupiscence which belong to a sensual and animal nature, and this inward conflict which the body wages adversus carnem[Gal. 5,17] is truly a spectacle worthy of God and of His Angels. But, alas, how rarely do we use this diligence and caution to conquer spiritual vices, of which pride is the first and the greatest of all, and which, sufficed of itself to transform an Angel into a demon! 2. Jesus Christ calls us all into His school to learn, not to work miracles nor to astonish the world by marvelous enterprises, but to be humble of heart. “Learn of Me, because I am meek and humble of heart.” [Matt. 11, 29] He has not called everyone to be doctors, preachers or priests, nor has He bestowed on all the gift of restoring sight to the blind, healing the sick, raising the dead or casting out devils, but to all He has said: “Learn of Me to be humble of heart,” and to all He has given the power to learn humility of Him. Innumerable things are worthy of imitation in the Incarnate Son of God, but He only asks us to imitate His humility. What then? Must we suppose that all the treasures of Divine Wisdom which were in Christ are to be reduced to the virtue of humility? “So it certainly is,” answers St. Augustine. Humility contains all things because in this virtue is truth; therefore God must also dwell therein, since He is the truth. The Savior might have said: “Learn of Me to be chaste, humble, prudent, just, wise, abstemious, etc.” But He only says: “Learn of Me, because I am meek and humble of heart”; and in humility alone He includes all things, because, as St. Thomas so truly says, “Acquired humility is in a certain sense the greatest good.” [Lib. de sancta virginit. c. xxxv] Therefore whoever possesses this virtue may be said, as to his proximate disposition, to possess all virtues, and he who lacks it, lacks all. 3. Reading the works of St. Augustine we find in them all that his sole idea was the exaltation of God above the creature as far as possible, and as far as possible the humble subjection of the creature to God. The recognition of this truth should find a place in every Christian mind, thus establishing—–according to the acuteness and penetration of our intelligence—–a sublime conception of God, and a lowly and vile conception of the creature. But we can only succeed in doing this by humility. The humblest man honors God most by his humility, and has the reward of being more glorified by God, Who has said: “Whoever honors Me, I will glorify him.” [1 Kings ii, 30] Oh, if we could only see how great is the glory of the humble in Heaven! 4. Humility is a virtue that belongs essentially to Christ, not only as man, but more especially as God, because with God to be good, holy and merciful is not virtue but nature, and humility is only a virtue. God cannot exalt Himself above what He is, in His most high Being, nor can He increase His vast and infinite greatness; but He can humiliate Himself as in fact He did humiliate and lower Himself. “He humbled Himself, He emptied Himself,” [Phil. ii, 7, 8] revealing Himself to us, through His humility, as the Lord of all virtues, the conqueror of the world, of death, Hell and sin. But to what purpose did He do all this if not that by this means all His followers should learn humility by practical example? He is our Master, and we are His disciples; but what profit do we derive from His teachings, which are practical and not theoretical? 5. There is a kind of humility which is of counsel and of perfection such as that which desires and seeks the contempt of others; but there is also a humility which is of necessity and of precept, without which, says Christ, we cannot enter into the kingdom of Heaven: “Thou shalt not enter into the kingdom of Heaven.” [Matt. xviii, 3] And this consists in not esteeming ourselves and in not wishing to be esteemed by others above what we really are. How and when do I practice its acts, acknowledging and confessing my unworthiness before God? The following was the frequent prayer of St. Augustine, “Noscam Te, noscam me—–May I know Thee; may I know myself!” and by this prayer he asked for humility, which is nothing else but a true knowledge of God and of oneself. To confess that God is what He is, the Omnipotent, “Great is the Lord, and exceedingly to be praised,” [Ps. xlvii, 1] and to declare that we are but nothingness before Him: “My substance is as nothing before Thee” [Ps. xxxviii, 6]—–this is to be humble.